The SRM Molecular Foundry; BioRegenerative Sciences, Inc. The initial few days following fertilization of the human egg, all stem cells in the developing egg are able to create any tissue in the human body. However, about four days following the fertilization of a human egg, the stem cells in the blastocyst begin to differentiate and become pluripotent instead of totipotent (Cauffman et al, 2009). At this point in time, many different stem cell types are beginning to form that will have unique function related to the development, maintenance, and healing of various tissues throughout the body. The degree to which stem cells differentiate into specific adult phenotypes is only recently beginning to be understood. For example, cell types, such as the progenitor cell preadipocyte and adipose-derived mesenchymal stem cells, each of which was previously classified as one cell type, have now been shown to have phenotypic differences depending on the location of the preadipocyte niches or mesenchymal stem cell niches (Macotela et al, 2012; Ong et al, 2014). The signaling factors controlling the development and function of the stem cell types, and indeed the signaling factors that each stem cell type releases, are relatively unknown, but progress is being made. For example, we know that adult stem cells release hundreds of types of proteins (Sze et al, 2007) within the molecular pool, called the stem cell released molecules (SRM), and that each cell type will release a unique pool of molecules (Ribeiro et al, 2012; Baradis et al, 2014). These molecules in the SRM will prove to be important for developing many types of therapeutics, including, for example, immunoregulators for organ transplantation (Kato et al, 2014). The more differentiated the stem cell, the more specialized the SRM will become. Further, that unique pool of molecules from one stem cell type can change in composition, including the types of molecular species, depending on intrinsic and extrinsic regulatory factors. For example, intrinsic factors related to simple passage number of a stem cell will change the composition of the SRM (Crisostomo et al, 2006; Deschne et al, 2014) and mesenchymal stem cells (MSCs) in different parts of the body will secrete unique pools of SRM (Park et al, 2009). Telomere dysfunction, whether the cause is intrinsic or extrinsic, will change the nature of the SRM (Ju et al, 2007). Likewise, preconditioning of human adipose-tissue-derived MSCs with the signaling molecule TNF-α had a profound impact on the SRM, and led to increased release of factors such as IL-6, IL-8, MCP-1, MMPs, PTX3, and Cathepsin L. (Lee et al., 2010). Further, signaling conditions during the immune modulating responses of human MSCs through Toll-like receptors (TLRs) on the MSCs leads to two basic phenotypic changes of the cells (MSC1 and MSC2) and a consequent dramatic difference in their SRM (Waterman et al, 2010). Culture conditions can also have dramatic effects on SRM. A significant increase in the secretion of several arteriogenic cytokines, including VEGF, bFGF, PlGF, and TGF-β, was observed after subjecting hMSCs to 72 hr hypoxia compared with normoxic conditions (Kinnaird et al., 2004), while serum deprivation, another in vitro model for ischemia, has also been shown to induce secretion of angiogenic factors by hMSCs, although the results could have been attributed to in full, or part, to differences in cell proliferation rates (Oskowitz et al., 2011). Glucose levels have been shown to differentially affect the phenotype of endothelial progenitor cells and mesenchymal progenitor cells (Keats and Khan, 2012). Indeed, subtle variations in cell culture conditions can have significant consequences to the phenotype of stem cells (Bear, 2014). The state of the extracellular matrix in the stem cell niche is also an important regulator of stem cell phenotype, where, for example, the absence of the SPARC protein in the ECM can drive hematopoetic stem cells into a state of quiescence (Ehninger et al, 2014). In the presence of antioxidants and FGF-2, adipose derived MSCs were shown to rapidly proliferate and retain their stem cell properties, and their osteogenic and adipogenic potentials were enhanced (Sun et al, 2013). Interestingly, new studies suggest that adult stem cells, and even somatic cells, may exist in a state of dynamic transition between different levels of potency (Tata et al, 2013; Kusaba et al, 2014) that is dependent on many factors, including paracrine and autocrine factors in the SRM from surrounding cells in the stem cell niche, and by the physical state of the stem cell niche (Su et al, 2013). The state of the oxidative stress in the stem cell may be a contributing factor in phenotype, including the state of pluripotency where the antioxidants curcumin and sesamin were shown to decrease oxidative stress and increase pluripotency (Yanes et al, 2010). Stem cell derived control factors for determining the fate of stem cells and the potency of cells, including the dedifferentiation of somatic cells, their proliferation, and subsequent differentiation, may include GDF11, a protein secreted by bone marrow mesenchymal stem cells (Lai et al, 2010) that has been shown to be involved in stem cell fate and proliferation (Gokoffski et al, 2011), and has recently been shown to induce a number of regenerative effects, including neurogenesis (Katsimpardi et al, 2014). Recent studies also demonstrate that NANOG, a pluripotency transcription factor in embryonic stem cells, is also present in at least some adult tissues further raising the possibility that a dynamic state of pluripotency is a naturally occurring process in adults (Piazolla et al, 2014). Again, these shifts in the state of pluripotency will have concomitant shifts in the composition of the SRM released from the stem cell. Given the differentiation of stem cells into distinct phenotypes, each of which releases a distinct pool of molecules with each distinct pool of molecules inducing a specific set of functions, a knowledge base of the secreted factors (SRM) from each stem cell type and the resulting actions from each pool of molecules will be instructive in the development of therapeutics. The resulting therapeutics that can be developed using the combination of many types of molecules has been termed “systems therapeutics” (Maguire, 2014). The “systems therapeutic” approach, where multiple molecule types target multiple pathways, is in contradistinction to the more traditional approach of small molecule development for perturbation of one pathway. Moreover, as the stem cell types are cultured ex vivo in the laboratory and driven to state-dependent specific phenotypes through genetic, epigenetic, and other state-dependent variables, the concentration and composition of the SRM as a result can be experimentally manipulated for the purposes of therapeutic development. In addition, distinct pools of SRM from two or more stem cell types cultured in state-dependent conditions can be combined into a collective pool of molecules called S2RM, mimicking the collective actions of multiple stem cell types in their native state in the human body. Cell replacement and regeneration occur in two basic forms: 1. renewal of spent cells during tissue homeostasis (homeostatic growth), and 2. responding to external injury, wounding, or amputation (epimorphic regeneration). A given healing process will require many actions acting through a well-orchestrated concert of mechanisms and molecules in the given tissue, and the result of this process depends on many factors, including the developmental age of the organism. Fundamental factors, such as caspases released from cells undergoing apoptosis, will activate both stem cells and progenitor cells in the wound healing process(Li et al, 2010), where apoptosis may be the driving force for cell proliferation during tissue regeneration a phenomenon termed “apoptosis-induced compensatory proliferation” (Fan and Bergman, 2008). Wounds occurring in early to mid-gestational fetal skin have been shown to heal through regeneration without the formation of a scar (Rowlatt, 1979), whereas adult wounds heal by a fibroproliferative response that emphasizes repair over regeneration. The complexity of this process, where fetal wounds differ from adult wounds in inflammatory responses, extracellular matrix (ECM) components, growth factor expression and responses, and profiles of gene expression is exemplified by the observation that adult skin in a fetal environment will still exhibit scar formation (Longaker et al, 1994). The state dependency of stem cells is so critical as shown in diabetes where the adipose stem cell niche in situ is altered, and the stem cells in the diabetic state are compromised in their ability to establish a vascular network both in vitro and in vivo (Rennert et al, 2014) where glucose itself has profound direct effects of stem cells (Cramer et al, 2010). Wound healing begins at the moment of injury and involves both resident and migratory cell populations, extracellular matrix, and the action of soluble factors, including SRM. Stem cells and progenitor cells resident in the skin are certainly involved, but recruitment of stem cells from other sources, including bone marrow, is thought to be important (Harris et al, 2007; Tamai et al, 2011). The mechanisms underlying the processes described above involve: 1. inflammatory mediators and growth factors, 2. cell–cell and cell–extracellular matrix interactions that govern cell proliferation, migration and differentiation, 3. events involved with epithelialization, fibroplasia and angiogenesis, 4. wound contraction, and 5. remodeling. These mechanisms are initiated at the time of physical injury and proceed continuously throughout the repair process. Despite the processes of repair beginning immediately after an injury in all tissues, and that all wounds go through similar phases of healing, specialized tissues, for example, liver, skeletal tissue, and the eye have distinctive forms of regeneration and repair and follow separate pathways (Lawrence, 1998). Severe injury has been shown to increase the number of circulating stem cells (Fu and Liesveld, 2000; Kucia et al, 2004) and that these stem cells will participate in the wound healing process (Badiavas et al, 2003). At the onset of trauma bone marrow stem cells will sense histamine released from platelets at H1 receptors and change their phenotype to one of releasing more IL-6 and more IL-8. The increased L-8 will attract polymorphonuclear neutrophil (PMN) cells, and the increased IL-6 will facilitate their survival through antiapoptotic functions (Nemeth et al, 2012). When the trauma inducing the injury has ceased, haemostasis has been realized, and an immune response set in place, the acute wound begins the tissue repair phase (Velnar et al, 2000). The proliferative phase starts on the third day after wounding and lasts for about 2 weeks thereafter. The process is characterized by fibroblast migration and deposition of newly synthesized extracellular matrix, building on the provisional network composed of fibrin and fibronectin. At the macroscopic level, this phase of wound healing can be clinically observed as an abundant formation of granulation tissue. The diverse processes that take place in the proliferative phase are briefly discussed below (Dieglemann and Evans, 2004). Following injury, fibroblasts and myofibroblasts in the surrounding tissue are stimulated to proliferate for the first 3 days (Witte and Barbul, 1997). They then migrate into the wound, being attracted by factors such as TGF-β and PDGF, that are released by inflammatory cells and platelets (Goldman, 2004). Fibroblasts first appear in the wound on the third day after injury and their accumulation requires phenotypic modulation. Once in the wound, the fibroblasts proliferate profusely and produce the matrix proteins hyaluronan, fibronectin, proteoglycans, and type 1 and type 3 procollagen, all of which are released locally (Ramasastry, 2005) By the end of the first week, abundant extracellular matrix accumulates, which further supports cell migration and is essential for the repair process. Next, fibroblasts change to their myofibroblast phenotype. At this stage, they contain thick actin bundles below the plasma membrane and actively extend pseudopodia, attaching to fibronectin and collagen in the extracellular matrix. Wound contraction, which is an important event in the reparative process that helps to approximate the wound edges, then takes place as these cell extensions retract. Having accomplished this task, redundant fibroblasts are eliminated by apoptosis (Goldman, 2004). MSCs are involved in all three phases of wound healing to varying degrees, whereby, for example, they recruit macrophages to the wound site (Chen et al, 2008), induce the fibroblast response to injury (Smith et al, 2010), and remodel the wound site (Hocking and Gibran, 2010), including a preferential release of collagen type III at the site (Fathke et al, 2004). While the MSCs contribute directly to wound repair by releasing molecules such as collagen to the wound (Fathke et al, 2004), the MSCs also act indirectly by releasing an instruction set to other cells thus initiating, for example, progenitor cell migration to the wound (Tasso et al, 2009). They also influence the wound’s ability to progress beyond the inflammatory phase and not regress to a chronic wound state. A significant component of the mechanism of action of MSCs is that they directly attenuate inflammatory response. Studies have shown that the addition of MSCs to an active immune response decreases secretion of the proinflammatory cytokines TNF-α and interferon-γ (IFN-γ) while simultaneously increasing the production of anti-inflammatory cytokines interleukin-10 (IL-10) and IL-4. It is these anti-inflammatory properties of MSCs that make them particularly beneficial to chronic wound treatment, as they can restart healing in stalled wounds by advancing the wound past a chronic inflammatory state into the next stage of healing. Accumulated data indicate the importance of MSC anti-inflammatory and immunomodulative activities in wound healing, detailed mechanisms of which are described in many reviews. A number of studies have shown that MSCs have antimicrobial activity, critical for wound clearance from infection. MSC antimicrobial activity is mediated by two mechanisms: 1. direct, via secretion of antimicrobial factors such as LL-37 (Servold, 1991), and 2. indirect, via secretion of immune-modulating factors that will upregulate bacterial killing and phagocytosis by immune cells (Baum and Arpey, 2005). Further, the phenotype of macrophages can be regulated by MSCs into various M1 and M2 classes directed to either antimicrobial, phagocytic activity or one of controlling inflammation (Kim and Hematti, 2009). MSCs in vivo can migrate to sites of injury in response to chemotactic signals modulating inflammation, repairing damaged tissue, and facilitating tissue regeneration. Furthermore, bone marrow stem cells home to the injury where cells in the wounded area secrete a protease that interacts with collagen matrix to produce a homing agent (Mauney et al, 2010). Differentiation and paracrine signaling are two key mechanisms by which MSCs improve tissue repair. MSC differentiation contributes by regenerating damaged tissue, whereas MSC paracrine signaling regulates the local cellular responses to injury. Current data suggest that the contribution of MSC differentiation of exogenous stem cells is limited due to poor engraftment and survival of MSCs at the site of injury, whereas the activation of endogenous stem cells may provide better results for the differentiation pathway (Arany et al, 2014). MSC paracrine signaling is likely the primary mechanism for the beneficial effects of MSCs on wounds, that is, to reduce inflammation, promote angiogenesis, and induce cell migration and proliferation (Greenhalgh,1998). Analyses of MSC-conditioned medium indicate that MSCs secrete many known mediators of tissue repair including growth factors, cytokines, and chemokines, specifically VEGF, PDGF, bFGF, EGF, keratinocyte growth factor (KGF), and TGF-β. Stem cells are also known to release exosomes (Maguire et al, 2013), and exosomes from mesenchymal stem cells have been shown to contain factors, including miRNA, that switch cancer stem cells into a dormant state (Ono et al, 2014). Such a mechanism is important to dampen the cells in a wound from moving into a state of cancer (Bissell and Hines, 2011). Studies indicate that many cell types, including epithelial cells, endothelial cells, keratinocytes, and fibroblasts, are responsive to MSC paracrine signaling, which regulates a number of different cellular responses including cell survival, proliferation, migration, and gene expression. MSC-conditioned medium acts as a chemoattractant for macrophages, endothelial cells, epidermal keratinocytes, and dermal fibroblasts in vitro. The presence of either MSCs or MSC-SRMhas been shown to promote dermal fibroblasts to accelerate wound closure. MSCs also secrete mitogens that stimulate proliferation of keratinocytes, dermal fibroblasts, and endothelial cells in vitro. Further investigation has shown that dermal fibroblasts secrete increased amounts of collagen type I and alter gene expression in response to either MSCs in coculture or MSC-conditioned medium . Overall, these data suggest that MSCs release soluble factors that stimulate proliferation and migration of the predominant cell types in the wound. In addition, the paracrine signaling of MSCs provides antiscarring properties through the secretion of VEGF and hepatocyte growth factor (HGF) and maintaining the proper balance between TGF-β1 and TGF-β3 . The molecular mechanisms of MSC involvement in wound healing are complex, and further details of these processes can be found in recent reviews. Stem cell niches in other regions of the body, including the hematopoietic stem cell niche, appear to be equally complicated as the skin stem cell niche with a rich interaction amongst many cell types, including a number of stem cell types and their respective SRM (Ehninger and Trumpp, 2011). Natually occurring endogenous iPSs, or naturally induced pluripotent stem cells (NiPSs) occur within the state dependent stem cell niche. The concept of dedifferentiation seems to be an important adaptive mechanism in both the animal (Echeverri and Tanaka, 2002) and plant kingdoms (Grafi and Barak, 2014). In addition to the therapeutic development of embryonic stem cells and iPSs, the use of adult stem cells and the molecules that they release have been intensively investigated and have current therapeutic applications. Further, the molecules released from stem cells or neighboring cells, such as ciliary neurotrophic factor (CNTF), have been shown to transform myogenic lineage-committed myoblasts at a clonal level to dedifferentiate into multipotent progenitor cells that were then able to differentiate into several new phenotypes (Chen et al, 2005). The endogenous mechanisms of adult stem cells, and possibly somatic cells in the stem cell niche, seem to include the ability to reprogram themselves into more primordial states that are pluripotent. That is, the adult stem cell, and even somatic cells, may exist in a state of dynamic transition between different levels of potency that is dependent on many factors, including paracrine and autocrine factors in the SRM from surrounding cells in the stem cell niche, and by the physical, chemical, and electrical state of the stem cell niche (Mammoto et al, 2013; Liu et al, 2013; Rhouabiha et al, 2013). Recently, treatment with reversine, a type of purine, transformed 3T3-L1 preadipocytes into MSC-like cells, as evidenced by the expression of MSCs marker genes. The transform allowed differentiation of lineage-committed 3T3-L1 preadipocytes to osteoblasts under the osteogenic condition in vitro (Park et al, 2014). Beyond transcription factors contained in the SRM, physical manipulation through the cytoskeleton is known to transmit signals to the chromatin and reprogram cells, and may represent an additional means for driving cells to varying levels of potency. Reprogramming of differentiated cells to stem-like cells has been described in several tissues and is well studied in the epithelial-mesenchymal transition where a differentiated epithelial cell transforms to a mesenchymal cell with a stem cell-like phenotype. Thus, by understanding adult stem cell function, we may develop the means to use these cells in many ways to maintain and heal the body, including a means of controlling naturally occurring iPSs. The physical, chemical, and electrical state of the stem cell niche will have profound influences on stem cell function. Alterations of the stem cell niche in diseases such as diabetes will decrease the ability of endogenous stem cells, or autologous administered stem cells, to increase neovascularization and promote wound healing (Rennert et al, 2014). In Figure 1, we see levels of interactions that may control the natural iPSC state. Considering wound healing as described in the aforementioned section, many factors, such as histamine, an important regulator of cell fate, including neurons (Bernadino et al, 2012; Panula et al, 2014), are released at the site of injury. As an example of the actions of these factors, histamine will activate TRPM4 calcium channels in the mesenchymal stem cells and bias the dynamic transition of the stem cells toward differentiation into the needed mature cells types at the injury site (Tran et al, 2014), including osteoclastogenesis (Biosse-Duplan, 2009). Similarly, exposure to sunlight will stimulate vitamin D3 levels and induce differentiation of stem cells, doing so through a downstream pathway that includes histamine (Pochampally , 2007). Reprogramming of cells to push the dynamic transition towards more potency has been specifically shown in mammalian cells whereby muscle cells(Mu et al, 2011) and pancreas cells (Tellez and Mantaya, 2014) will dedifferentiate into a more pluripotent state following Injury, and where fibroblasts were incubated in cell extracts of adipose-derived stem cells. The fibroblasts displayed pluripotent gene expression that was associated with the loss of repressive histone modifications and increased global demethylation. The genes Col1a1 and Col1a2, which are typically found in differentiated cells only, demonstrated decreased expression and increased methylation in the 5′-flanking regulatory regions (Rong, 2014). Of the many factors released by mesenchymal stem cells, microRNA is one of the factors that have been shown to induce pluripotency in mouse and human somatic cells (Anoyke-Danso et al, 2011). In general, stress is a key factor that can naturally induce pluripotency. For example, simple isolation of mammalian cells from contact with other cells and their normal niche, originally exhibiting a limited differentiation potential, may become multipotent (Shoshani et al, 2014). Pluripotent cells can reside in the naïve state or the primed state where the naïve state is more potent than the primed state (Nichols and Smith, 2009). Dedifferentiation under hypoxic conditions can drive committed cells beyond the primed state fully back to the naive state of potency where the pluripotent cells are then capable of forming teratomas (Mathieu et al, 2013). Cancer cells and pluripotent stem cells follow certain common rules. Both cell types, when placed in a dysregulated extracellular matrix, will exhibit an increased state of potency . Cancer cells, when returned to a regulated extracellular matrix (ECM), will revert to a normal phenotype (Bissell and Hines, 2011; Booth et al, 2011). Likewise, dedifferentiation of cells into a pluripotent state can occur when the cell is isolated and looses connections with other cells and the ECM (Shoshani et al, 2014), and stem cells that have differentiated can revert to a more pluripotent state by changes in the concentration of the ECM associated protein, L-proline (Comes et al, 2013). Thus, induction of pluripotent stem cells is a naturally occurring phenomenon that can be controlled in vivo for therapeutic effect by manipulating the state of the stem cell niche. Diseases are not a simple consequence of abnormality in one pathway, or even at one level of the organism, such as at the level of genes. Rather, disease reflects the perturbations of the complex system of intracellular networks acted on by complex environmental regulators. Much of previous work to understand disease and drug response traits have focused on single dimensions of the system. Achieving a more comprehensive and predictive understanding requires examining living systems in multiple dimensions and at multiple scales. Although biological engineering principles are necessary, with the necessity to remove unnecessary complexity for the development of a particular therapeutic, the individual components of complex systems are so tightly coupled that the components cannot be analyzed in isolation. This predicament in biology, such as the desire to place the sequencing of the genome as the singular predictor of disease, is similar to that dictum in physics where electrodynamics was broken down into the misbegotten particles and fields theorem by Bohr and his Copenhagen interpretation(Mead, 2013). Biological complexity is an extreme example of complexity, and arises from the inclusion of active, plastic components, flexible design principles, nested feedback loops, component multi-functionality, and multiple layers of system dynamics developed through evolutionary processes that are, at least partially, driven through environmental regulators. The power of the dynamic biological system has been recognized in engineering where, for example, neuromorphic engineering (Mead, 1989) has become an important player in the development of new computer chip technologies such as TrueNorth (Merolla et al, 2014). Even with the introduction of systems biology to the fields of biology and therapeutic development, the mindset in therapeutic development has often remained one of using systems biology for finding the one pathway, or the one target, that is best perturbed to develop the therapeutic. “Finding the magic bullet” is a common phrase that describes this common problem. Instead, the correct thinking needs to shift to one of finding the minimum set of pathways, or the minimum set of targets, using the “minimum molecule set” to perturb in order to best develop a therapeutic. That is, biology is a system, and a particular disease state is the result of multiple perturbations in that system, not just one perturbation. Therefore, only through a thorough understanding of biocircuits in normal and disease states, and using computationally intensive biological design-build-test-analyze cycle, with therapeutic molecule production batches based on this process, can we hope to develop safe and efficacious therapeutics through a multi-targeted, “systems therapeutic” approach. The approach then is to use a reductionist set (system) of molecules, the minimum molecule set (MMS), that is not overly reductionist so as to be ineffective, but instead use the least number of necessary molecules that are sufficient to realize a safe and efficacious therapeutic. The notion that human diseases are the result of complex interactions among networks has significant implications for drug discovery, leading to the design of molecule combinations that impact entire network states rather than designing drugs that target specific disease associated genes. The attempt to develop animal-derived antimicrobials is not new. For example, in the 1990s great hope, and many dollars spent, was placed on the development of a small peptide from frog (Xenopus laevis) skin as an antibiotic (Zassloff, 1987). The observation that frog skin heals itself, despite the frog living in a very septic environment, led to the formation of Magainin Pharmaceuticals. After years, and millions of dollars, spent on development and Phase II clinical trials, today Magainin’s assets are the auction block (Magainin changed names to Genera and then liquidated: http://www.fiercebiotech.com/press-releases/genaera-corporation-announces-approval-plan-liquidation-and-dissolution-board-direc-0). Why? Because the frog’s skin does not heal itself through a reductionist approach with only one molecule (a peptide), and Magainin didn’t fully learn the frog’s lesson. The lesson not learned was that Magainin developed their antibiotic based on one peptide, a reductionist approach, instead of a mix of antimicrobial factors, a systems antimicrobial approach. Lipids were first demonstrated by Koch (1881) to have antibiotic activity, and exists in human skin, for example, as a wide range of molecule types comprising a significant part of the innate immune system (Fischer et al, 2012; Thormar et al, 2013). Like Magainin, a similar reductionist approach was used in the development of squalamine, a lipid compound (aminosterol) derived from the dogfish shark (Squalus acanthias). Squalamine was initially discovered on the basis of its anti-bacterial activity, and has broad spectrum antimicrobial activity against fungi, protozoa, and many viruses (Moore et al, 1993). Sadly, isolated squalamine was never approved for antimicrobial use and is now sold as a nutritional product by a number of companies in capsule form. Once again, the “Copenhagen reductionist” approach to therapeutic development has failed us. Here again, instead, an approach to developing antimicrobials using a collection of molecules, including peptides and lipids, is in development. Cancer is strongly associated with a deregulated ECM (Lu, Weaver, Werb, 2012). While cancer and stem cells are regulated by many factors, both cancer cells and pluripotent stem cells follow certain common rules such as regulation by the ECM. Both cell types, when placed in a dysregulated extracellular matrix, will exhibit an increased state of potency . Cancer cells, when returned to a regulated extracellular matrix (ECM), will revert to a normal phenotype (Bissell and Hines, 2011; Booth et al, 2011). Likewise, dedifferentiation of cells into a pluripotent state can occur when the cell is isolated and looses connections with other cells and the ECM (Shoshani et al, 2014), and stem cells that have differentiated can revert to a more pluripotent state by changes in the concentration of the ECM associated protein, L-proline (Comes et al, 2013). Given that that the ECM can act through mechanical and biochemical mechanisms to regulate the cancer phenotype, one important means to revert the cancer phenotype to the normal somatic cell phenotype is to use S2RM technology to reestablish a normal ECM microenvironment for the cancer cell. That is, using one progenitor cell type to release the building blocks of the ECM, such as collagen, and using another stem cell type to release other building blocks and the instruction sets to build the architecture of the ECM, the normal state of the ECM can be rebuilt and lead to the reversion of the cancer cell phenotype to a more normal somatic cell phenotype as depicted in Figure 2. In summary, the S2RM technology provides a natural means for mimicking and stimulating the healing properties of the human body. Instead of using foreign molecules, natural molecules are used that will induce the initiation of natural processes with little or no side-effects. Further, instead of using a small molecule approach where one molecules interacting at one pathway underlying a multi-pathway disease is used, here the S2RM approach uses multiple molecules to perturb multiple pathways underlying the disease, thus yielding a more efficacious result than the one molecule-one pathway reductionist approach. The S2RM approach will introduce all of the needed molecules to the tissue to induce a full wound healing cascade of events, unlike an approach using the molecules from one stem cell type that will introduce only a portion of the needed molecules and thus provide a fraction of the efficacy that the S2RM provides. And, S2RM uses the particular molecules from the particular stem cells types relevant to the particular tissue to be healed. This is distinct from the “one size fits all” approach where one stem cell type is used to develop therapeutics for the whole body. Therefore, S2RM provides all of the building blocks, such as the different collagen types, to rebuild the tissue, and also provides the instruction set molecules, such as microRNA, that will deliver the needed architectural commands that will lay the building blocks in their proper places for that particular tissue. During this rebuilding process, the immune response will also be modulated by S2RM, so that inflammation is quelled, allowing the rebuilding to proceed within a normalized framework that is not swollen. The S2RM rebuilding process institutes two fundamental stem cell healing processes: 1. Mimicking the actions of multiple stem cell types and the molecules that they release in the relevant tissue, and 2. Reconditioning the stem cell niche itself and driving the niche to a more primordial, potent state, allowing endogenous stem cell processes to better induce a healing response. Thus, a systems therapeutic approach using multiple molecules from multiple stem cell types called S2RM is used to develop a safer, more natural, and more efficacious therapeutic that both mimics and facilitates the natural adult stem cell healing processes of our body. FIG. 1. The wounded state sends a homing signal to bone marrow stem cells and disrupts the ECM. Disruption of the ECM will shift the dynamic transition of potency towards dedifferentiation and the more pluripotent state. The more pluripotent state will cause the cells to proliferate. After proliferation, the migration of bone marrow stem cells to the wound site will release SRM, including GDF-11, that stops proliferation and induces differentiation allowing newly differentiated somatic cells to repair the tissue. Thus, in our model, GDF11 is released from BMSCs and is a master regulator of stem cell transcription that inhibits cell proliferation and migration by down-regulating the expression of numerous genes involved in both these processes (Williams et al, 2013). ECM-D = Extracellular Matrix Disruption. SC = somatic cell. PPSC = pluripotent stem cell. BMSC = bone marrow stem cell. PSC = potent stem cell. FIG. 2. The cancer/pluripotent cell phenotype can be regulated by the ECM and stem cells, where cancer cells can be removed from a dysregulated ECM and placed into a normal ECM and the cancer/pluripotent phenotype will revert to a normal, somatic cell phenotype. Likewise, if a dysregulated ECM is reconstructed into a normal state, the cancer/pluripotent phenotype will revert to the normal somatic cell phenotype. Further regulation of the cancer/pluripotent phenotype can be regulated by a number of factors, including microRNA contained within exosomes that were released from mesenchymal stem cells serving to change the state of the cancer cell into one of quiescence. Anokye-Danso, F. et al (2011) Highly efficient miRNA-mediated reprogramming of mouse and human somatic cells to pluripotency. Cell Stem Cell 8: 376–388. Bernadino, L. et al (2012) Histamine stimulates neurogenesis in the rodent subventricular zone. Stem Cells. 2012 Apr;30(4):773-84. Biosse-Duplan, M. et al (2009) Histamine Promotes Osteoclastogenesis through the Differential Expression of Histamine Receptors on Osteoclasts and Osteoblasts. Am J Pathol. Apr 2009; 174(4): 1426–1434. Carol L. Fischer, David R. Drake, Deborah V. Dawson, Derek R. Blanchette, Kim A. Brogden and Philip W. Wertz. (2012) Antibacterial Activity of Sphingoid Bases and Fatty Acids against Gram-Positive and Gram-Negative Bacteria. Antimicrob. Agents Chemother. 56(3):1157. Cauffman, G. et al (2009) Markers that define stemness in ESC are unable to identify the totipotent cells in human preimplantation embryos. Hum. Reprod. (2009) 24 (1): 63-70. Comes et al (2013) L-Proline Induces a Mesenchymal-like Invasive Program in Embryonic Stem Cells by Remodeling H3K9 and H3K36 Methylation. Stem Cell Reports. 4: 307–321. Cramer, C. et al (2010) Persistent High Glucose Concentrations Alter the Regenerative Potential of Mesenchymal Stem Cells. Stem Cells and Development. 19: 1875-1884. Crisostomo PR1, Wang M, Wairiuko GM, Morrell ED, Terrell AM, Seshadri P, Nam UH, Meldrum DR.(2006) High passage number of stem cells adversely affects stem cell activation and myocardial protection. Shock. 6:575-80. Deschne et al. (2014) β-Catenin Activation Regulates Tissue Growth Non–Cell Autonomously in the Hair Stem Cell Niche. Science Vol. 343 : 1353-1356. Diegelmann RF, Evans MC (2004) Wound healing: an overview of acute, fibrotic and delayed healing. Front Biosci 2004; 1: 283 – 289. Ehninger, E.A. et al (2014) Loss of SPARC protects hematopoietic stem cells from chemotherapy toxicity by accelerating their return to quiescence. Blood. 2014 Jun 26;123(26):4054-63. Fathke, C. et al (2004) Contribution of Bone Marrow–Derived Cells to Skin: Collagen Deposition and Wound Repair. Stem Cells. 2004; 22(5): 812–822. Gokoffski, K.K. et al (2011) Activin and GDF11 collaborate in feedback control of neuroepithelial stem cell proliferation and fate. Development. 2011 Oct;138(19):4131-42. Goldman R (2004) Growth factors and chronic wound healing: past, present and future. Adv Skin Wound Care 2004; 17: 24 – 35. Grafi, G. and Barak, S. (2014) Stress induces cell dedifferentiation in plants. Biochim Biophys Acta. S1874-939. Greenhalgh DG (1998) The role of apoptosis in wound healing. Int J Biochem Cell Biol 30: 1019 – 1030. Kato T1, Okumi M, Tanemura M, Yazawa K, Kakuta Y, Yamanaka K, Tsutahara K, Doki Y, Mori M, Takahara S, Nonomura N. (2014) Adipose Tissue-Derived Stem Cells Suppress Acute Cellular Rejection by TSG-6 and CD44 Interaction in Rat Kidney Transplantation. Transplantation. 2014 Jun 30. Kim, J. and Hematti, P. (2009) Mesenchymal stem cell-educated macrophages: a novel type of alternatively activated macrophages. Exp Hematol. 12: 1445–1453. Hocking AM, Gibran NS (2010) Mesenchymal stem cells: Paracrine signaling and differentiation during cutaneous wound repair. Exp Cell Res 316:2213–2219. Ju, Z. et al (2007) Telomere dysfunction induces environmental alterations limiting hematopoietic stem cell function and engraftment. Nature Medicine 13, 742 – 747. Katsimpardi, L. et al (2014) Vascular and neurogenic rejuvenation of the aging mouse brain by young systemic factors. Science 344(6184):630-4. Koch R. Über Desinfection. Mittheil. des kaiserl. Gesundheitsamtes. 1881;1:234–282. Kusaba, T. et al (2014) Differentiated kidney epithelial cells repair injured proximal tubule. Proc Natl Acad Sci U S A. 111(4):1527-32. Lai, R.C. et al (2010) Exosome secreted by MSC reduces myocardial ischemia/reperfusion injury. Stem Cell Research 4:214-222. Lawrence WT (1998) Physiology of the acute wound.Clin Plast Surg 1998; 25: 321 – 340. Liu,M., Liu, N., Zang, R., Li, Y. and Yang, S. (2013) Engineering stem cell niches in bioreactors. World J Stem Cells. 5: 124–135. Longaker, M.T et al (1994) Adult skin wounds in the fetal environment heal with scar formation. Ann Surg. Jan 1994; 219(1): 65–72. Maguire, G. et al (2013) Stem cell released molecules and exosomes in tissue engineering. Procedia Engineering. Volume 59, Pages 270–278. Maguire, G. (2014) Systems biology approach to developing “systems therapeutics.” ACS Med Chem Lett. 2014 Mar 6;5(5):453-5. Mammoto T, Mammoto A, Ingber DE. Mechanobiology and developmental control. Annu Rev Cell Dev Biol. 2013; 29:27-61. Mathieu, J. et al (2013) Hypoxia induces re-entry of committed cells into pluripotency. Stem Cells 31:1737-48. doi: 10.1002/stem.1446. Mauney J1, Olsen BR, Volloch V. (2010) Matrix remodeling as stem cell recruitment event: a novel in vitro model for homing of human bone marrow stromal cells to the site of injury shows crucial role of extracellular collagen matrix. Matrix Biol. 8:657-63. Mead, C. (2013) The nature of light: What are photons? SPIE : 883202: 1-7. Moore, K S; S Wehrli, H Roder, M Rogers, J N Forrest, D McCrimmon, M Zasloff (1993). “Squalamine: an aminosterol antibiotic from the shark”. Proceedings of the National Academy of Sciences of the United States of America 90 (4): 1354–8. Mu, X. et al (2011) Study of Muscle Cell Dedifferentiation after Skeletal Muscle Injury of Mice with a Cre-Lox System. PLoS One 6(2): e16699. Ong et al (2014) Identification of Specific Cell-Surface Markers of Adipose-Derived Stem Cells from Subcutaneous and Visceral Fat Depots. Stem Cell Reports , Volume 2 , Issue 2 , 171 – 179. Park, C.W., Kim, K.-S., Bae, S., Son, H.K., Myung, P.-K., Hong, H.J., and Kim,H. (2009). Cytokine secretion proﬁling of human mesenchymal stem cells by antibody array. Int. J Stem Cells 2, 59–68. Park JG, Lee DH, Moon YS, Kim KH. (2014) Reversine increases the plasticity of lineage-committed preadipocytes to osteogenesis by inhibiting adipogenesis through induction of TGF-β pathway in vitro. Biochem Biophys Res Commun. 446: 30-6. Ramasastry SS (2005) Acute wounds. Clin Plast Surg 2005; 32: 195 – 208. XiongXian-Rong, LanDao-Liang, LiJian, ZiXiang-Dong, MaLi, and WangYong (2014) Cellular Extract Facilitates Nuclear Reprogramming by Altering DNA Methylation and Pluripotency Gene Expression. Cellular Reprogramming. 16: 215-222. Rowlatt, U (1979) Intrauterine wound healing in a 20 week human fetus. Virchows Arch A Pathol Anat Histol: 381: 353. Servold SA (1991) Growth factor impact on wound healing. Clin Podiatr Med Surg 8: 937 – 953. Smith, A.N. et al (2010) Mesenchymal stem cells induce dermal fibroblast responses to injury. Exp Cell Res. Jan 1, 2010; 316(1): 48–54. Sze, SK et al (2007) Elucidating the secretion proteome of human embryonic stem cell-derived mesenchymal stem cells. Mol. Cell Proteomics 6: 1680-1689. Tamai K, Yamazaki T, Chino T, Ishii M, Otsuru S, Kikuchi Y, Iinuma S, Saga K, Nimura K, Shimbo T, Umegaki N, Katayama I, Miyazaki J, Takeda J, McGrath JA, Uitto J, Kaneda Y. PDGFR alpha-positive cells in bone marrow are mobilized by high mobility group box 1 (HMGB1) to regenerate injured epithelia. PNAS. 2011;108:6609–14. Tasso, R et al (2009) Recruitment of a host’s osteoprogenitor cells using exogenous mesenchymal stem cells seeded on porous ceramic. Tissue Eng Part A. 2009 Aug;15(8):2203-12. Tata, P.R. et al (2013) Dedifferentiation of committed epithelial cells into stem cells in vivo. Nature 503, 218–223. Tellez,N. and Mantaya, E. (2014) Gastrin induces ductal cell dedifferentiation and β-cell neogenesis after 90% pancreatectomy. J. Endocrinology, doi: 10.1530/JOE-14-0222. Velnar, T., T Bailey, V Smrkolj (2000) An overview of the wound healing process. Wound Care ; 9: 299 – 300. Williams, G. et al (2013) Transcriptional Basis for the Inhibition of Neural Stem Cell Proliferation and Migration by the TGFβ-Family Member GDF11. PLoS One. 2013; 8(11): e78478. Lu, P., Weaver,V.M., and Werb, Z. (2012) The extracellular matrix: A dynamic niche in cancer progression. JCB vol. 196 no. 4 395-406. Yanes, O. et al Metabolic oxidation regulates embryonic stem cell differentiation. Nat Chem Biol. Jun 2010; 6(6): 411–417. Zasloff M (1987). “Magainins, a class of antimicrobial peptides from Xenopus skin: isolation, characterization of two active forms, and partial cDNA sequence of a precursor”. Proc. Natl. Acad. Sci. USA 84 (15): 5449–5453. The SRM Molecular Foundry at UCSD; BioRegenerative Sciences, Inc.
Last month, 28 March 2014, the National Institutes of Health (NIH) closed the agency’s Center for Regenerative Medicine (CRM), and the center’s director Dr. Mahendra Rao, a prominent stem cell biologist, left the NIH1. The CRM was established in 2010 to centralize stem cell research activities within the NIH, with the goal to develop therapeutics based on using induced pluripotent stem cells (iPS). The iPS is a mature cell that has been genetically modified, similar to that which is familiar to many people as a genetically modified organism (GMO), to transform the mature cell into a cell with stem cell-like properties. The genetic reprogramming of the mature cell into an iPS means that the newly transformed cell will have properties like an embryonic stem cell whereby the iPS can mature (differentiate) into many types of new cells, whether that new cell type be a nervous system cell or a heart cell or some other cell type, in order to generate that particular tissue in the nervous system or the heart and thus repair the damaged tissue of that particular organ. The importance of the iSC was not only for ethical and religious reasons because an embryo is not destroyed in the making of an iSC, but also because the iSC can be created from somatic cells taken from the same patient that will receive the iSC transplant. Because the iSC comes from the same donor, the possibility of immune mediated implant rejection is obviated or minimized. The goals of the CRM to focus on the iPS were very ambitious and of great potential importance. But perhaps the goal to focus mainly on iPSs was too narrow. Over the last few year several laboratories have reported reprogramming errors in the iPSs, including genetic errors found by Goldstein’s lab at the University of California, San Diego,2 and epigenetic errors found by Ecker’s lab at the Salk Institute.3 The differences (errors) observed between iPSs and embryonic stem cells fall into the categories of gene copy number variation, chromosome duplication, epigenetic variation, and acquired protein coding point mutations. This means that the fundamental nature of the iPS, and the constituent parts of the cell being formed contain errors and the iPS does not have the same characteristics of an embryonic stem cell. Further, this array of errors often occurs in cancer associated regions of the genome and potentially increase the risk of tumor formation were the iPS to be used as a therapeutic. Thus, while the iPS is of great importance to possible therapeutic development, the efficacy and safety of these cells is still under investigation and the cells are not yet warranted for therapeutic use. In addition to the therapeutic development of embryonic stem cells and iPSs, the use of adult stem cells and the molecules that they release have been intensively investigated and have current therapeutic applcations.4 For example, during the past four decades adult stem cells have been used as a therapeutic in cancer treatment.5 The adult stem cell procedure can be of three types, 1. Autologous —the cells come from you, 2. Allogeneic —the cells come from a matched related or unrelated donor, and 3. Syngeneic – the cells come from your identical twin or triplet. Given the three types of cell acquisition, adult stem cells of many types are abundantly available for therapeutic development. Further, using the stem cell released molecules from adult stem cells, a collection of hundreds of types of molecules, leads to a promising area of therapeutic development called “systems therapeutics.”6 Systems therapeutics is based on using multiple molecule types to target multiple pathways, instead of the more traditional, reductionist approach where a small chemical entity is used to target one pathway to ameliorate the condition. Because any function, and hence any dysfunction, involves multiple pathways, the system therapeutic is a potentially more powerful means to cure the ill, and the SRM from adult stem cells and the collective actions of all the molecules is instructive about how to develop systems therapeutics. As the NIH regroups and discusses plans for future directions in stem cell therapeutic development,1 short and long term strategies need to be considered as to what technologies are available now for development, such as adult stem cell-based technologies, and what technologies offer hope for advances in the coming years, such as iPS technology. My reasoning is not binary – I am not arguing for one or the other, rather I am arguing that our stem cell research and therapeutic development needs to include all stem cell types, and consider all of the possible mechanisms through which stem cells provide therapeutic benefit – including not only differentiation into mature tissue, but also the very powerful paracrine and autocrine effects of the stem cell released molecules (SRM). Often overlooked in view of how stem cells provide therapeutic benefit is the SRM, but as we look more closely at stem cell mechanisms of action more studies are showing the benefit of SRM.7 Considering adult stem cells and their SRM, through reverse engineering of the means through which our adult stem cells heal the body we can discover powerful innate mechanisms that can be both mimicked and augmented. The endogenous mechanisms of adult stem cells, and possibly somatic cells in the stem cell niche, seem to include the ability to reprogram themselves into more primordial states that are pluripotent.8,9 That is, the adult stem cell, and even somatic cells, may exist in a state of dynamic equilibrium between different levels of potency that is dependent on many factors, including paracrine and autocrine factors in the SRM from surrounding cells in the stem cell niche, and/or by the physical state of the stem cell niche.10 Thus, by understanding adult stem cell function, we may develop the means to use these cells in many ways to maintain and heal the body, including a means of controlling naturally occurring iPSs. Diseases are not a simple consequence of abnormality in genes, but reflect the perturbations of the complex system of intracellular networks acted on by complex environmental regulators. The vast majority of previous efforts to elucidate disease and drug response traits have focused on single dimensions of the system. Achieving a more comprehensive, predictive view of common human diseases requires examining living systems in multiple dimensions and at multiple scales. The individual components of complex systems are so tightly coupled that the components cannot be analyzed in isolation, rendering traditional reductionist approaches to science irrelevant, obscuring causal relationships, and lacking an ability to distinguish complexity from mere complication. Biological complexity is an extreme example of complexity, and arises from the inclusion of active, plastic components, nested feedback loops, component multifunctionality, and multiple layers of system dynamics developed through evolutionary processes that are, at least partially, driven through environmental regulators. Systems biology is an emerging approach that seeks to understand the foundations of biology not only at the reductionist molecular level but also by incorporating those reductionist data sets into a larger framework that describes the dynamic interactions of the various levels of information into an emergent, systems level understanding of structure, function, and behaviors. Our current drug development model is in trouble. Through the recent dominant approach of developing small chemical entities that interact with one specific target and often relying on data predominantly at one level, i.e., genomics, the cost of drug development has risen sharply, while approval rates have fallen. Even with the introduction of systems biology to the fields of biology and therapeutic development, the mindset in therapeutic development has often remained one of using systems biology for finding the one pathway, or the one target, that is best perturbed to develop the therapeutic. “Finding the magic bullet” is a common phrase that describes this common problem. Instead, the correct thinking needs to shift to one of finding the minimum set of pathways, or the minimum set of targets, using the “minimum molecule set” to perturb in order to best develop a therapeutic. That is, biology is a system, and a particular disease state is the result of multiple perturbations in that system, not just one perturbation. 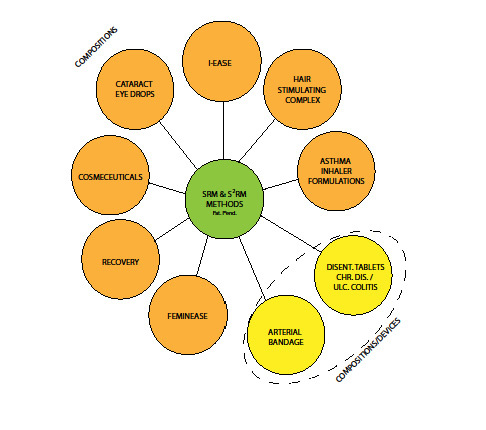 Therefore, only through a thorough understanding of biocircuits in normal and disease states and using computationally intensive biological designbuild-test-analyze cycle, with therapeutic molecule production batches based on this process, can we hope to develop safe and efficacious therapeutics through a multitargeted, “systems therapeutic” approach. The approach then is to use a reductionist set (system) of molecules, the minimum molecule set (MMS), that is not overly reductionist so as to be ineffective, but instead use the least number of necessary molecules that are sufficient to realize a safe and efficacious therapeutic. The notion that human diseases are the result of complex interactions among networks has significant implications for drug discovery, leading to the design of molecule combinations that impact entire network states rather than designing drugs that target specific disease associated genes. We all understand the premise of upward causation, that human diseases and drug response are complex traits that involve entire networks of changes at the molecular level driven by genetic and environmental perturbations. We also understand that changes at the molecular level can induce changes in biochemical processes or broader molecular networks that affect cell behavior and that changes in cell behavior can affect normal tissue or whole organ function, eventually leading to pathophysiological states at the organism level that we associate with disease. Consideration that downward causation exists in these networks is not usually accounted for in our models, nor is the notion that there is no one network level of causation that is privileged.1 That is, an understanding of disease is not likely to arise from a simple understanding of the genome in a disease state, rather multiple levels of understanding are likely needed, such as protein networks, lipid networks, metabolic networks, tissue networks, and environmental networks and that causation flows in all directions among the different networks. For example, recent studies suggest that environmental regulators of retrotransposons are involved in schizophrenia,2 and behavioral effects have profound consequences on cancer.3 As Noble has stated, no one level of causation is privileged, and causation can be considered at many levels, including from the middle out.4 When we ask the age old question, “what came Published: March 6, 2014 Viewpoint pubs.acs.org/acsmedchemlett © 2014 American Chemical Society 453 dx.doi.org/10.1021/ml5000614 | ACS Med. Chem. Lett. 2014, 5, 453−455 first, the chicken or the egg?” the answer is that the two coevolved through multiple levels of causation, both upward and downward. Using a mathematical point of view, every component of a biological system can be described in kinetic terms as shown in the Motif of Figure 1. While the level and scale, for example, ion flux through an ion channel on the millisecond scale versus plaque development on a scale of months, will be different for each component, the Motif in each case will be of similar form. Considering the Motif at the level of DNA, a difference in DNA sequence may have a wide variety of possible phenotypic effects, including no effect at all, until the boundary conditions are set, including the actions of many other genes, the metabolic and other states of the cell or organism, and the environment in which the organism exists. Therefore, consideration of a disease state with data at only one level, including DNA sequence alone without the necessary boundary conditions, will result in no predictability of the disease. Further, in analogy with differential equations, knowing only the differences at a given level, for example, as in genome-wide association studies, will poorly predict outcomes. Instead one must integrate the data to understand the necessary and sufficient components and functions. Thus, a differential equation alone has an infinite set of solutions until those possibilities are constrained by the downward causation of boundary conditions. This means that multiple levels of causation are in play, including downward causation. Incorporation of all these data sets into a predictable model is a classic big data problem. ■ AUTHOR INFORMATION Corresponding Author *E-mail: gmaguire@srmfoundry.org. Views expressed in this editorial are those of the author and not necessarily the views of the ACS. The authors declare the following competing financial interest(s): Dr. Maguire is co-owner of BioRegenerative Sciences, Inc.
(1) Noble, D. A theory of biological relativity: no privileged level of causation. Interface Focus 2012, 2, 55−64. (2) Bundo, M.; Toyoshima, M.; Okada, Y.; Akamatsu, W.; Ueda, J.; Nemoto-Miyauchi, T.; Sunaga, F.; Toritsuka, M.; Ikawa, D.; Kakita, A.; Kato, M.; Kasai, K.; Kishimoto, T.; Nawa, H.; Okano, H.; Yoshikawa, T.; Kato, T.; Iwamoto, K. Increased L1 retrotransposition in the neuronal genome in schizophrenia. Neuron 2014, 81, 306−313. (3) Waters, D. J. Aging research 2011: exploring the pet dog paradigm. ILAR J. 2011, 52, 97−105. (4) Noble, D. Neo-Darwinism, the modern synthesis and selfish genes: are they of use in physiology? J. Physiol. 2011, 589, 1007−1015. (5) Hodgkin, A. L.; Huxley, A. F. A quantitative description of membrane current and its application to conduction and excitation in nerve. J. Physiol. 1952, 117, 500−544. (6) Nobel, D. Cardiac action and pacemaker potentials based on the Hodgkin−Huxley equations. Nature 1960, 188, 495−497. (7) Maguire, G. Using a systems-based approach to overcome reductionist strategies in the development of diagnostics. Expert Rev. Mol. Diagn. 2013, 13, 895−905. (8) Goldenfeld, N.; Woese, C. Life is physics: evolution as a collective phenomenon far from equilibrium. Ann. Rev. Condens. Matter Phys. 2011, 2, 375−399. (9) Mead, C. Collective Electrodynamics; MIT Press: Cambridge, MA, 2006. (10) Maguire, G. Stem cell therapy without the cells. Commun. Integr. Biol. 2013, DOI: 10.4161/cib.26631. I-Ease is a sterile topical ophthalmic eye drop for treating dry eye or keratoconjunctivitis sicca. The topical composition includes proteins derived from cultured stem cells obtained from the human eye. The eye drops utilize Stem Cell Released Molecules (SRM) obtained from culturing stem cells to form a multitude, or system, of proteins (SRM), which includes growth factors, cytokines, and other factors, also known to be involved in wound healing and used to treat the dry eye within a model of wounded and inflamed corneal tissue. Further, the SRM from two or more types of stem cells when used in combination provides a positive, synergistic effect that enhances the healing process beyond that observed with the use of SRM from only one cell type. When two or more cells are used to produce SRM, and the SRM combined from the different cell types, we call this S2RM. I-Ease has been shown to be safe and effective in dry eye patients, glaucoma patients, allergy patients, and those with corneal transplants. It has now been shown that the classic aqueous-dominated tear film model of dry eye has been replaced by the more probable concept of a mucin and protein-dominated gel, including growth factors and cytokines. This gel has its highest concentration of proteins and mucins at the epithelial surfaces of the cornea and conjunctiva, and the protein and mucin concentration gradually decreases farther out into the tear film. In this model, the presence of proteins and mucin remains significant for the structure, stability and function of the entire tear film. In support of this new model of the tear film, treatments for dry eye that are produced from the patient’s serum have been shown to be effective in treating dry eye. The serum is thought to be effective because of the growth factors and cytokines contained in the serum. Many protein factors, such as Keratinocyte growth factor (KGF) and hepatocyte growth factor (HGF), are paracrine factors that maintain the tear film function and a healthy cornea, such as through the regulation of the proliferation, migration and differentiation of multiple types of limbal epithelial and stem cells. Recent studies of the tear film using laser interferometry and confocal microscopy indicates that the human tear film is 30 to 40 microns thick, more than four times thicker than earlier estimates (see for example Prydal, et al. 1992 and Prydal, et al. 2005). Based on tear film physiology and clinical observations, tear film abnormalities are commonly designated by focus on a specific deficiency, such as an aqueous tear deficiency, keratoconjunctivitis sicca (KCS), a mucin deficiency, a lipid abnormality, an impaired lid function, or an epitheliopathy. Although clinically useful, the simplistic concept of a lack of one component of the tear film as the cause of dry eye has given way to a much more sophisticated view of ocular surface disease that involves: (1) the health and regulation of the various glands contributing secretions to the tear film, (2) changes in the tear film itself, such as in osmolality and content of proteins and inflammatory mediators, and (3) what is viewed as a sort of final common pathway, the subsequent changes to the ocular surface (See McKenzie, et al. 2000). In fact, many clinicians and authors prefer the term “ocular surface disease” over “dry eye”, for it is change to the ocular surface, whatever the original cause, that results in the significant signs and symptoms of dry eye. The discomfort of ocular surface disease is expressed in ocular symptoms, such as dryness, grittiness, burning, soreness or scratchiness, with variation among individuals. These symptoms can also be exacerbated by factors such as environmental conditions and contact lens wear. The combination of varying clinical signs and symptoms has also been termed dry eye syndrome. In the human eye, the secretory mucins MUC2 and MUC5AC have been detected (via transcripts at the nucleic acid level) from conjunctival isolates, and only MUC5AC has been localized to conjunctival goblet cells (See Pflugfelder, et al. 2000 and Sylvester, et al. 2001). Unique characteristics of normal human secreted ocular mucins are their wide size range and short oligosaccharide side chains. The transmembrane mucin MUC1 is associated with the cell membranes of the entire corneal and conjunctival epithelial surface, except the goblet cells. Another transmembrane mucin is the mucin MUC4, which is associated with the cell membranes of the entire conjunctival epithelial surface, except the goblet cells. In a mild to moderate dry eye, the goblet cell density is not significantly reduced indicating that MUC5AC is most likely to be produced normally, in quantities sufficient to be spread over the entire ocular surface. However, localized early ocular surface changes resulting from dryness, such as that revealed by fluorescein or rose bengal staining, can be seen in the epithelia of the corneal and conjunctival surfaces. This localized damage to the ocular surface indicates that even marginal dryness might have a significant effect on the presence of functional MUC1 on the surface of the ocular epithelium. Since one of the proposed functions of MUC1 is to help the other, more abundant gel-forming ocular mucins adhere to the ocular surface, a paucity of MUC1 might significantly affect the stability of the tear film, even in the presence of an abundance of MUC5AC secreted by the conjunctival goblet cells (See Watanabe, et al. 2002 and Gipson 2004). There is some early evidence that with the progression of changes to the ocular surface mucins associated with dry eye, as detected by immunohistochemical methods, the goblet cells themselves try to make up for the lack of normal expression of MUC1 by the rest (non goblet cells) of the corneal and conjunctival surface epithelium, and begin expressing a MUC1-like molecule in their secretions. The secreted ocular mucins are relatively large molecules, and have a significant role in the gel-forming nature of the tear film. The model of the greater part of the tear film being a highly hydrated mucus gel, rather than simply a watery aqueous layer, is becoming increasingly accepted. The viscoelasticity of the tear film derives from the specific structure and gel-forming properties of the ocular mucins, and allows the tear film to absorb the sheer force of the blink, which would otherwise irritate and damage the ocular surface. The transmembrane mucin, on the other hand, serves more as a protective layer on the actual cellular surface of the ocular epithelium, functioning to directly protect and lubricate the ocular surface, as well as to anchor the highly hydrated gel (mucus) of the tear film gel forming mucins, thereby assisting in the spreading and stability of the tear film over the ocular surface. The importance of mucin in the natural tear fluid as a wetting agent, viscoelastic gel former, lubricant and barrier to bacterial adhesion has largely been reported. Limited success with so many various synthetic and substitute polymers indicate that supplementing the tear fluid with a compatible mucin from an exogenous source would appear to be a more direct and preferred method for addressing dry eye conditions. Part of the problem in the development of ocular surface changes in dry eye disease may be the dehydration of the mucus gel and subsequently the mucin layer of the cellular surface. Supplementing the tear fluid with mucin in an aqueous solution would be expected to help maintain the natural surface mucin layer of the eye by both the addition of the additional mucin molecules and the hydration provided by the aqueous vehicle. The belief that the tear film is aqueous based and the ocular surface changes seen in Sjogren’s syndrome are due to desiccation, cause eye care practitioners to water the dry eye. However, studies show that, as stated above, the tear film is dominated by proteins and mucin and not water. (See Nelson, et al. 1992) The human tear film is not a 7-10 thin film, but a 30-35 p.m thick mucin gel. Bicarbonate may be critical to forming this gel as it is in forming the bicarbonate mucin gel that protects the stomach from autodigestion. (See Ubels, et al. 1995) The hallmark of the aqueous deficient dry eye, rose bengal staining of the conjunctiva, is not produced by desiccated cells, but is due to a deficiency in the protective mucin gel. (See Gilbard, et al. 1992) The ocular surface changes in dry eye include conjunctival squamous metaplasia, loss of integrity of cell membranes and junctional structures (fluorescein staining), and loss of the integrity of the mucin layer (rose bengal staining). Rose bengal staining and squamous metaplasia are not improved by the frequent application of non-preserved preparations. (See Nelson 1998) Bicarbonate and electrolyte solutions promote recovery of barrier function and ultrastructure in damaged ocular surface cells and increase corneal glycogen and goblet cell density. (See VanSetten 1990 and Kiatazawa, et al. 1990, respectively) These solutions, however, do not totally reverse ocular surface disease seen in Sjogren’s syndrome. Even with the addition of electrolytes and bicarbonate to artificial tears, watering the dry eye is not enough. It has been found that the application of autologous serum improved fluorescein and rose bengal scores and squamous metaplasia. This treatment also resulted in significant upregulation of MUC-1 in conjunctival epithelial cell cultures. The authors believed that the epidermal growth factor (EGF), vitamin A, and transforming growth factor (TGF) found in serum represent critical components missing from the tears of patients with Sjogren’s syndrome. Studies have shown that some cytokines play an important role in the regulation of proliferation, differentiation, and maturation of the ocular surface epithelium, while other cytokines may be harmful. (See Weng, et al. 1996) Experimental studies demonstrate that EGF and hepatocyte growth factor (HGF), (See Vervo, et al. 1997; Van Sletten 1996; Yoshino, et al. 1996; Slomiany, et al. 1991; and Sotozono, et al. 1998) which are present in human tears and secreted by the lacrimal gland, are important in corneal wound healing. Both also increase as aqueous tear production increases. TGF-cc and TGF-P are found in human tears. (See Ubels, et al. 1986 and Ono, et al. 1994) Both are probably involved in corneal epithelial cell growth and differentiation. (See Ono, et al. 1994) Retinol, also secreted by the lacrimal gland and found in the tear film, is necessary for the maintenance of healthy ocular surface epithelium. (See Ono, et al. 1994) Not only may the tear film of patients with Sjogren’s syndrome be missing critical components, tears may actually contain substances that lead to ocular surface injury. Cytokines may be produced in or by the lacrimal gland in response to inflammation. These factors, delivered to the ocular surface by the tear fluid, may lead to inflammation of the ocular surface. mRNA for interleukins IL-1 and IL-6 has been detected in the lacrimal glands of autoimmune female MRL/lpr mice. (See Wilson, et al. 1996) Increased levels of IL-1 induces keratocyte apoptosis and metalloproteinases. (See Wilson, et al. 1996 and Girard, et al. 1991) IL-6 induces lymphocytic differentiation. In Sjogren’s syndrome, reflex tearing decreases with increased lymphocytic infiltration of the lacrimal gland. (See Tsubota, et al. 1996) Reflex tearing flushes debris from the ocular surface, dilutes substances in the tear film, and delivers higher amounts of certain cytokines to the ocular surface. The loss of reflex tearing results in reduced tear clearance causing prolonged retention of substances in the tear film. (See Barton, et al. 1997) It is likely that the loss of reflex tearing also results in the lack of delivery of cytokines and retinol critical to the growth and differentiation of ocular surface epithelial cells. The upregulation of MUC-1 suggests there are substances in serum, which promote reformation of the mucin gel, and, therefore, resolution of rose bengal staining. It is believed that similar substances, that are important in the maintenance of the mucin gel, are probably missing in the Sjogren’s dry eye. Others have speculated on the use of serum tears. (See Fox, et al. 1984) Tsubota et al. suggests that serum tears, alone, may not be sufficient to treat dry eye. For example it has been found that the presence of cytokines and retinol are critical for the growth, differentiation, and wound healing of the ocular surface. Artificial tears flush out debris; dilute substances trapped in the tear film, and increase tear clearance. They do not, however, provide all the factors critical for the maintenance and repair of the ocular surface. I-Ease by BRS provides a method of treating dry eye by topically administering to the eye a human cornea and conjunctiva-derived combination of mucins and/or growth factors, or growth factors and cytokines derived from adult stem cells, in an ocular drop instillable composition which derived proteins and mucin is similar to those of the tear film proteins and transmembrane mucin expressed on the ocular surface epithelium, and to the gel-forming mucins secreted by the goblet cells. The novel compositions of I-Ease protects the ocular surface from dryness and absorbs shear forces of the blink, and assist the eye’s own secreted gel forming mucins (predominantly MUCS) in maintaining their viscoelastic properties and ensuing structure and stability of the tear film, thereby slowing or preventing the changes to the ocular surface seen in dry eye conditions. Additionally, I-Ease also treats the medical presentation of dry eye as, in part, a typical, progressive abrasion of the cornea causing a traumatic/wound condition that is ameliorated by the topical application of the SRMs to the eye, leading to a wound healing cascade and reduction of inflammation. BioRegenerative Sciences was formed in 2009 to translate the discoveries of Dr. Greg Maguire while a professor at the University of California, San Diego School of Medicine. Those early studies at UCSD in the 1990s helped establish that adult stem cells release molecules into damaged tissue to induce tissue repair and regeneration, and that two (2) or more types of stem cells were involved, each type releasing a different pool of molecules to effectuate a synergistic healing response. The combination of molecules from a stem cell is called SRM (stem cell released molecules), and the SRM from two or more stem cell types is called S2RM. Maguire and Friedman developed these ideas into a patent-pending platform technology for the commercialization of a number of therapeutics, including the BRS eye drops, called I-Ease, for Dry Eye, and another eye drop, called Lens-Ease, for Cataract. These products contain the S2RM® molecules, and not any cells or tissues. Our approach has been described as “stem cell therapy without the cells” (Maguire 2013), leading to a type of therapeutic called a “systems therapeutic” (Maguire, 2014). Both products have been shown to be highly safe and efficacious in animal and human testing. Furthermore, while many new drugs/biologics brought to market recently were shown to have positive clinical risk benefit, many of the new drugs currently awaiting pricing from reimbursement authorities have not addressed relative cost benefit . In contradistinction, the efficacy and the cost of the BRS products both display great relative superiority to comparative products on the market. Adult stem cells in the human body are present in most tissues, including the eye, serving to regenerate and repair the tissue, quell pain, and modulate the immune response. Approximately eighty percent (80%) or more of the healing capacity of adult stem cells derives from their release of multiple molecules, including growth factors, cytokines, interleukins, antioxidants, exosomes, microRNA, and chaperone proteins, into the damaged tissue resulting in the orchestration of a healing response. The unique nature of the S2RM® technology centers on the identification, selection, culture, and stimulation of the appropriate stem cells, and then the capture of those molecules released from the stem cells. In this manner, proprietary and patent-pending technology is used in the BioRegenerative Science (BRS) laboratory to capture what the stem cells normally release in the body. This is a systems based approach where, instead of a reductionist approach using one or two molecules for treatment, all of the molecules from the stem cells act together as they normally do in the body in order to deliver the emergent properties of the system of all molecules. Further, BRS uses a technology that mimics the manner in which the body heals itself whereby two or more types of stem cells become resident at the site of injury, and the two or more types of stem cells release their pools of molecules into the tissue in concert, producing an emergent and powerful, synergistic healing effect. The overall effects of S2RM technology are twofold: 1. Mimicking the effects of SRM on those cells surrounding the stem cells, and 2. Enhancing the effects of the endogenous stem cells themselves. The S2RM® technology, exclusively used by BioRegenerative Sciences, has the advantage compared to other stem cell technologies of capturing a full and natural complement, or “system,” of known molecules. This full complement of captured molecules from stem cells are subsequently injected into, or topically applied to, the patient in a defined and precise spatiotemporal dosing schedule to begin the systems-based regenerative process. The known dosing parameters for S2RM are in contradistinction to that for stem cell-based therapies where the cells cannot easily be controlled once they are removed from the laboratory setting and administered to the body. Examples of topical S2RMTM Technology include eye drops for dry eye therapy, and for cataract. Tear fluid forms a tear film over the cornea and the conjunctiva of the eye. Dry Eye is associated with a reduction in the quantity and/or quality of the tear film. The tear film contains aqueous solution, a broad spectrum of fatty acids , and a multitude of signaling molecules, including SRM . The composition of the tear film is significantly altered in dry eye, including a down regulation of many proteins as analyzed by proteomics of 386 protein types in human dry eye patients . The source of these proteins in the tear film, as well as the source of other signaling molecules, is not well understood but likely from multiple cell types, including stem cells, in the various ocular tissues. The constant bathing of the anterior ocular tissue with SRM is thought to be important for maintaining the cornea and conjunctiva. The BRS approach to restoring the tear film in dry eye is to replace the missing signaling molecules though an application of SRM to the corneal surface. The BRS product is called I-Ease, a sterile ophthalmic solution that is dropped into the eye and supplies S2RM® to the anterior surface of the eye to bathe the cornea and the conjunctiva in all of the molecules needed to maintain and heal tissue. The mechanism of action of I-Ease is believed to: 1. increase the anti-oxidant capacity of the cornea, 2. recondition the stem cell niche of the limbus and 3.mimic the release of SRM from the resident stem cells in the stem cell niche of the limbus and secreting glands of the eye, including the meibomian gland. As we age, the continued incidence of photons on the lens tissue, and the consequent oxidation of the tissue, along with other aging mechanisms, including stem cell dysfunction in the lens capsule and epithelium [5,6], degrades the lens tissue and results in opacification. While little is known about the exact causes of cataract, we know that, for example, the lens capsule is a reservoir for growth factors  to maintain the tissue, and that a high antioxidant capacity within the lens is needed to buffer the len’s constant light exposure. The BRS approach to restoring lens function and to preclude or reduce cataract formation is to replace the missing signaling molecules though an application of SRM and antioxidants to the lens. The BRS product is called Lens-Ease, a sterile ophthalmic solution that is dropped into the eye and supplies S2RM® and added antioxidants to the lens, thus bathing the lens in all of the molecules needed to maintain, protect, and heal tissue. The mechanism of action of Lens-Ease is believed to: 1. increase the anti-oxidant capacity of the lens, 2. recondition the stem cell niche of the lens capsule and 3. mimic the release of SRM from the resident stem cells in the lens capsule stem cell niche. Figure 1. 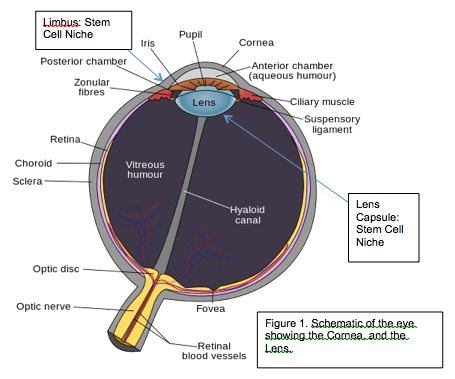 Schematic of the eye showing the Cornea, and the Lens. Figure 2. 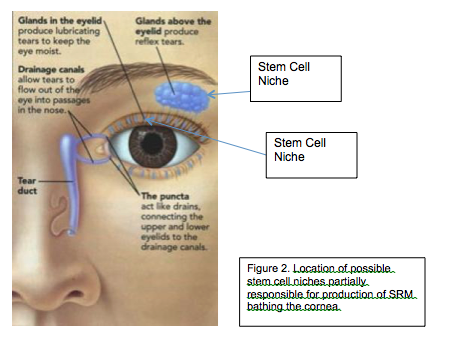 Location of possible stem cell niches partially responsible for production of SRM bathing the cornea. Over 100 patients successfully using the product for severe dry eye, post-LASIK irritation, Fuch’s corneal dystrophy, corneal ulcer, and post-transplant irritation. Ophthalmologists in North and South America carry the product in their offices for sale to patients, and the product is being recommended by Dr. Anne Coleman, MD, PhD., faculty at Jules Stein Eye Institute, UCLA School of Medicine, and Dr. Colleen Grace, M.D. at the University of Michigan, Henry Ford Hospital. Figure 3. 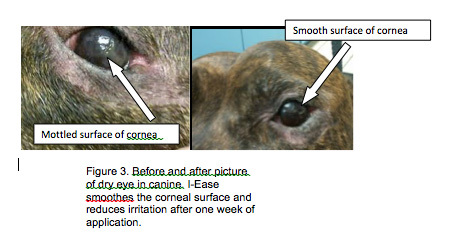 Before and after picture of dry eye in canine. I-Ease smoothes the corneal surface and reduces irritation after one week of application. I began wearing contact lenses when I was a senior in high school. I wore contacts daily for a period of about four years with no problems at all. I regularly replaced my contacts and followed each of my doctor’s instructions. After some time, I began to slip up and occasionally fell asleep with my contacts in. I began to notice a minor burning sensation and irritation when wearing contacts, which progressively worsened until I was unable to wear contacts at all. I thought that by taking some time off, wearing my glasses and allowing my eyes to heal, that I might again be able t wear contact lenses. Turns out that I was wrong, my eyes did not heal on their own, not even after 4 years of wearing glasses. I tried several treatments as directed by my doctor, but nothing worked. I had all but given up on ever wearing contact lenses again. Then, I met Peter and Greg from BioRegenerative Sciences, who gave me a free sample of I-Ease. After using I-Ease twice a day for about a week, I finally was able to wear my contact lenses. I now wear contacts every day, and continue to use I-Ease for maintaining healthy eyes. I would recommend I-Ease to anyone who has trouble wearing contact lenses due to irritability. Pilot studies suggest L-Ease is powerful in preventing and reducing cataract formation. Thus far 15 people are using the L-Ease with positive results. Several patients are being followed by ophthalmologists or other health care providers. Imaging shows the cataract diminishing in size over a period of several months, and patients report fewer visual disturbances after 1-4 months of usage. Additional animal and human studies are needed. Two years ago, at a routine eye exam, I was told that I had small cataracts developing in both eyes, nothing requiring surgical intervention, but to be watched. Given the extensive sun exposure in the past, combined with aging, this was not a huge surprise. The next year I was told the same thing, small, but to be watched. I was noticing one difference in my vision – an increased amount of “starring” around lights at night, which was very annoying, especially as I sometimes drive long distances at night. About 6 months after the last exam I started using the L-Ease, initially one drop a day, sometimes one drop two times a day if I remembered it. The drops have not caused any irritation or difficulty with my vision after using them, no side effects that I have noticed at all and I have been able to continue using my gas permeable contacts as usual. The one difference that I experienced is a decrease in the “starring” after using the drops for about 3 months. This was a notable difference for me and continues to be markedly improved. Last week I had my yearly eye exam. The description of my cataracts when I inquired was “trace”, “minimal”. It was also interesting that I have a slight improvement in my astigmatism in the Right eye. I have had significant astigmatism in both eyes since grade school which has only worsened, never improved at all. I’ve not had a Lasik procedure or used any medications or interventions other than the L-Ease, which would account for the changes that I have chronicled. I will continue to use the L-Ease, as I feel I can only benefit. I’ve had an increase in quality of my night vision and quantitative improvement in my eye health instead of a decrease in eye health which accompanies aging. Great drops! The BRS “Intelligent Molecules” Expression System, described in our paper (Maguire et al, 2013), employs a proprietary manufacturing process that allows the production of a wide variety of soluble and properly folded proteins and signaling molecules from multiple stem cell types important to immune modulation, and tissue repair and regeneration. The advantages of the process are in the production of biologically active proteins, exosomes, and signaling molecules, developing a “systems therapeutic” yielding a combination of many molecules, that act at multiple targets, resulting in a synergistic therapeutic with emergent therapeutic value. Furthermore, the production of the SRM (stem cell released molecules) does not require downstream solubilization, refolding, or other processes. Additionally, the process offers reduced purification requirements and lower production costs than other pharmacological and biological processes. The production of a therapeutic with a multitude of molecules represents a multi-targeted, systems biology approach to designing and manufacturing therapeutics. In the BRS “Intelligent Molecules” Expression System, multiple stem cell types are used to express SRM and thus the term “S2RM®” is used to denote that two or more types of stem cells are used to produce a synergistic effect. The combination of stem cells used to develop each therapeutic depend on the condition being treated, and the type of tissue underlying the condition. Included in the S2RM® is the BRS Exosome Delivery System that drives the active molecules through the layers of tissue into the target site, effectuating regeneration and repair in all damaged tissue regardless of the depth or remoteness of the target. Unlike other so-called stem cell therapeutics, such as induced pluripotent stem cells (iPSCs) and parthenogenetic stem cells, which are artificially induced “stem cells,” and suffer from genetic and epigenetic programming errors, the adult stem cells in S2RM® Technology are genetically and epigenetically normal. Further, the production of some “stem cell” therapeutics does not allow the molecules to be completely processed in the cell and allow for proper post-translational modifications. That is, the S2RM® Technology allows the stem cells to fully process the molecules to the point of exosome production and release, including complete post-translational modification with resultant normal molecular folding characteristics and moiety construction. Thus, unlike iPSCs and parthenogenetic “stem cells” that don’t produce the complete set of the natural molecules of a stem cell and also fail to complete the full assembly of each of the molecules, the true adult stem cells in S2RM® Technology display correct genetic and epigenetic coding, with complete post-translational modifications to produce a natural and full complement of molecules, and with our processing technology the molecules develop complete post-translational modifications and hence full efficacy and a natural safety profile. BRS was founded in 2009 by Dr. Greg Maguire and Peter Friedman, and incorporated in the USA in 2010. In 1997 Dr. Maguire, who was professor at the University of California, San Diego, began injecting stem cells into the eye and brain for the regeneration of neural tissue. Those initial studies led to the discovery that stem cells release molecules into the damaged tissue to orchestrate a healing response. Other studies showed that multiple stem cell types, not just one type, home into the damaged tissue. These early studies, along with the work at BRS by Maguire and Friedman, led to the development of BRS’ patents that center on the S2RMTM Technology whereby the molecules, called stem cell released molecules (SRM), from multiple stem cell types, hence the designation S2RM, are used to formulate our therapeutic products. Our IP strategy includes procurement of domestic and foreign patents in key markets for novel technologies relating to BRS’ core technology as well as such collateral technologies which are intended for product development and commercialization. While we disclose compositions and processes in our patents, not all processes are disclosed and remain as intellectual assets (trade secrets) within only a few individuals in the organization, namely Dr. Greg Maguire and Peter Friedman. 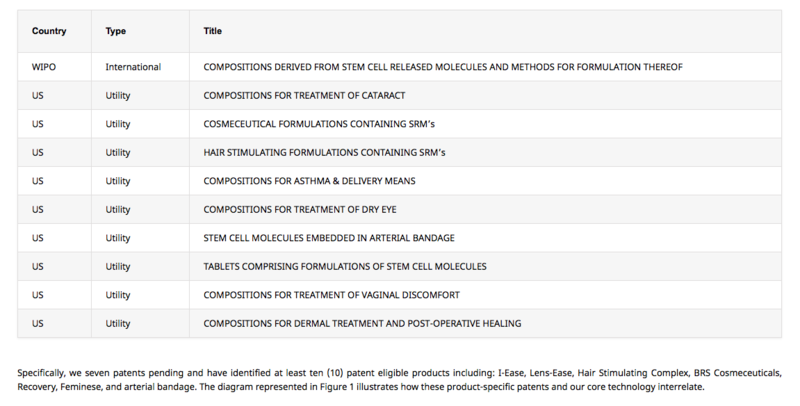 Currently, BRS has filed patent applications in the US relating to our core technology (See Table 1, below). Dry eye is estimated to be a $1billion/year market in USA. Restasis has been the drug of choice at a cost of about $200/month to the consumer, and Restasis doesn’t work well (10% above placebo, FDA summary basis of approval) and stings the eyes. I-Ease eye drops by BRS is much more effective than Restasis, doesn’t sting, and costs $70/month, or less. Cataract is debilitating, especially in our aging population. Current treatment is a costly and painful surgery that removes the lens and uses an artifical replacement lens. BRS’ L-Ease is an eye drop that prevents and reduces cataract formation allowing the patient to avoid surgery. We currently sell Lens-Ease for about $100/month. Results are usually seen in 2 to 4 months. 1. Cost and time to gain approval. Topical products with easy clinical endpoints to measure, and large, easily accessible patient populations to recruit for clinical trials. 2. Large and growing markets. Each condition represents a large and growing patient population world-wide. 3. Unserved or underserved market. Each condition lacks effective products for treatment of the particular condition. 4. Chance for FDA “Fast track” status that will prioritize and hasten the approval time. 5. Because the products are very efficacious, we expect a relatively low number of patients will need to be recruited and tested because a low variability in the clinical endpoint results. Therefore the trials should be relatively low costs given the fewer patients needed in the studies. -Dry Eye – Estimated market in USA is approximately $1Billion annually. World-wide market is unknown, but underserved and growing. -Cataract – The only treatment for cataract is currently lens replacement, a costly and invasive procedure that patients would like to avoid if a product were available on the market. -Dry Eye – The product Restasis by Allergan is currently the product of choice. Restasis is not very effective: 10% better than placebo according to the FDA’s summary basis of approval. Restasis is also stingy and very expensive. Ophthalmologists tell me they don’t like to prescribe Restasis because of the expense and lack of efficacy, but that they currently have no better choice. With FDA approval/world-wide registration we expect quick acceptance by ophthalmologists and significant script activity. An aging population means a greater incidence of cataract. No other product is available to prevent or treat cataract. Only cataract extraction through lens replacement is available as a treatment; an expensive and invasive procedure that is not well liked by patients. Our only entry to barrier will be that those ophthalmologists performing lens replacement surgery who will not embrace a product that lowers their surgery rate and therefore lowers their income. Products will need to be manufactured in cGMP facility starting with first-in-man studies. The I-Ease for dry eye, and the L-Ease for cataract will need to be manufactured as sterile eye drops. The active ingredients are manufactured by BRS, Inc. in the USA. All other excipients in the products are standard, easily-sourced, inexpensive ingredients commonly known to pharmaceutical manufacturers. License each product to large pharma company with world-wide reach and appropriate sales force. We estimate a $1.5 million investment to bring each product through phase II. At phase III we would license the technology to a large pharma company for the studies and to bring the products to market. de Souza GA, Godoy LM, Mann M (2006) Identification of 491 proteins in the tear fluid proteome reveals a large number of proteases and protease inhibitors. Genome Biol 7(8): R72. Brian P. Danysh and Melinda K. Duncan (2009) The Lens Capsule. Exp Eye Res. 2009 February; 88(2): 151–164. Mingyuan Zhou, Joshua Leiberman, Jing Xu, and Robert M. Lavker (2006) A Hierarchy of Proliferative Cells Exists in Mouse Lens Epithelium: Implications on Lens Maintenance. Invest Ophthalmol Vis Sci. 47(7): 2997–3003. Maguire, G. et al (2013) Stem cell released molecules and exosomes in tissue engineering. Procedia Engineering. Maguire, G. (2013) Stem cell therapy without the cells. Commun Integr Biol. 2013 Nov 1;6(6):e26631. doi: 10.4161/cib.26631. Maguire, G. (2014) Systems biology approach to developing “systems therapeutics”. ACS Med Chem Lett. 2014 Mar 6;5(5):453-5. doi: 10.1021/ml500061. The SRM Molecular Foundry and BioRegenerative Sciences, Inc.
Abstract. Nanoparticles, particularly exosomes, are naturally produced in great quantities by human stem cells. Exosomes are a nanosphere that are produced by stem cells for the purposes of protecting, and packaging hundreds of types of signaling molecules into one delivery vehicle so that the whole collection of molecules can be co-delivered in time and space and therefore utilized as one synergistically acting set of molecules by the neighboring target cell. Exosomes are smart nanospheres given their ability to easily diffuse through tissues, seek out target cells, pass the brain-blood barrier, and exhibit immunoprivilege. The lipid bilayer of the exosome contains transmembrane proteins with a variety of external peptide sequences, and numerous polysachharides on the outer leaflet that impart smart behavior to the liposome-like structure. Further, genetic, epigenetic, and state-dependent regulation of the manufacture of the exosome by the stem cell can lead to important manipulation of many characteristics of the nanosphere for pharmaceutical delivery purposes. Defined manipulation of these naturally produced nanospheres can be useful for modifying the content, and the targeting and delivery characteristics of the nanosphere. Therefore, the exosome represents a powerful new platform technology to develop and scale-up a very safe and efficacious drug delivery system useful for many different drug dosing regimens, and for delivery to most parts of the body.